The volume of United States Mint circulating coin shipments to Federal Reserve Banks rose for the fourth consecutive year. During the fiscal year ended September 30, 2013, total shipments reached nearly 10.7 billion coins representing an increase of 17.8% compared to the prior year. The shipments had a total value of $578.0 million and generated $137.4 million in seigniorage. The United States Mint manufactures circulating coins which are shipped to Federal Reserve Banks in quantities necessary to replenish inventory and meet demand from commercial banks and financial institutions. The banks and financial institutions distribute coins to meet the demand of retailers and the public. In times of excess supply, circulating coins may be returned to Federal Reserve Banks, where they are held in inventory and serve to reduce orders for new coins. The Mint recognizes revenue based on the face value of the coins as they are shipped to Federal Reserve Banks. Seigniorage is generated from the difference between the face value of the coins and the cost to manufacture and distribute. The unit volume of cents, nickels, dimes, and quarters shipped to Federal Reserve Banks all rose during FY 2013. The cent accounted for the greatest unit volume at 6.6 billion pieces, accounting for 61.8% of all circulating coin shipments. The largest percentage increase in shipments was seen for the quarter dollar denomination, up by 118.5% compared to the prior year. The production of quarters had fallen significantly after the conclusion of the 50 State Quarters Program and due to the impact of the recession. For several years, Federal Reserve Banks held a surplus of quarters which minimized the need for production and shipment of new coins. 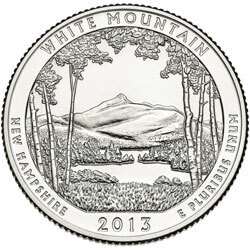 With the surplus finally worked down, the need for newly minted coins has rebounded. The Mint did not ship any $1 coins to Federal Reserve Banks during FY 2013. Following a Treasury Department decision in December 2011, the denomination would no longer be produced and distributed for circulation. The quantity of 97 million shipped during FY 2012 represented the distribution of the 2011 James Garfield Presidential Dollars and other 2011-dated coins prior to the suspension. The cost of producing and distributing the cent and nickel exceeded the respective face values of the denominations. Although there was a reduction in costs for each denomination during FY 2013, higher production levels kept losses close to the prior year levels at $55 million for the cent and $49.5 million for the nickel. The dime and quarter each cost less than their respective denominations to produce. The total seigniorage generated from these two denominations more than offset the losses from the cent and the nickel. Across the entire circulating coin segment, the US Mint generated seigniorage of $137.4 million. This was up by 29.7% from the prior year when seigniorage of $105.9 million was generated. The United States Mint transferred $350 million in seigniorage to the Treasury General Fund during FY 2013. This was the first such transfer in three years. From 2007 to 2011, the $1 coin had been driven the majority of seigniorage for the Mint. After the suspension of production for circulation in late 2012, the US Mint had chosen to retain seigniorage amounts due to uncertainty resulting from the impact of the loss of revenue from the $1 coin and the continued losses generated by the cent and nickel. The recent increased demand for the quarter dollar as well as cost reduction efforts at the Philadelphia and Denver Mint facilities have mitigated these concerns, allowing the seigniorage amounts to be released.